Jeff and Jen Stappenbeck started dating around the time they both became members of New Hope back in 2011. 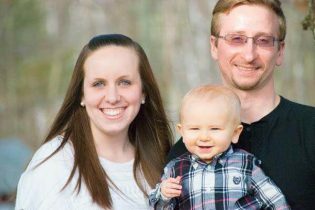 They were already both involved heavily in ministry; but after they got married, they moved to Massachusetts where Jeff began serving on a pastoral team in a church there. They have a heart for the Lord, have been involved in serving Him in many ways for years, and love New Hope! We are excited to have them come on board with us as Jeff serves on our pastoral team and they have reunited with us again as their church family! Favorite Music: Music that moves my emotions and mind to worship…John 4:24 stuff. That means it includes everything from Praise and Worship (Current Favorites right now: Bethel Worship Collective) to Rock (Current Favorites: For Today and Wolves at the Gate). Favorite Hobbies/Pastimes: Spending time relaxing with my family, reading, talking about theology and ministry, watching football, listening to and/or playing music. Dream Vacation: Trip to Europe. Little known fact about pastor Jeff: At one point, I dated Minnie Mouse. Well..she wasn’t really Minnie Mouse, she just played her as a character at Walt Disney World. Biggest Passions: Being a part of a church that is passionate about reaching unchurched people. I am passionate about preaching and ministering with a bent towards unchurched people being able to understand and know how to make steps towards Christ, while challenging Christians to move forward in their own walk with Christ.